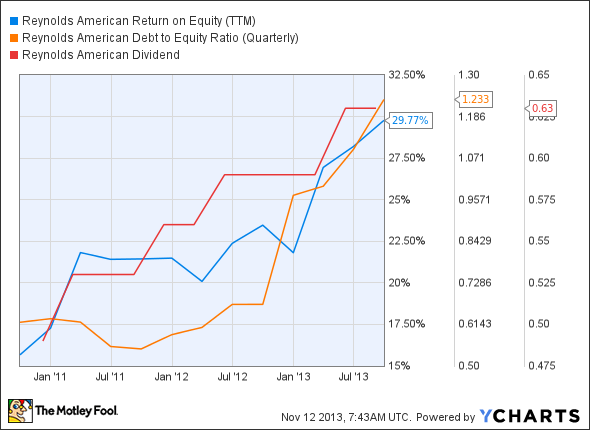 Is Reynolds American Destined for Greatness? Reynolds American (RAI) has had a hard time maintaining its grasp on a shrinking market. Investors love stocks that consistently beat the Street without getting ahead of their fundamentals and risking a meltdown. The best stocks offer sustainable market-beating gains, with robust and improving financial metrics that support strong price growth. 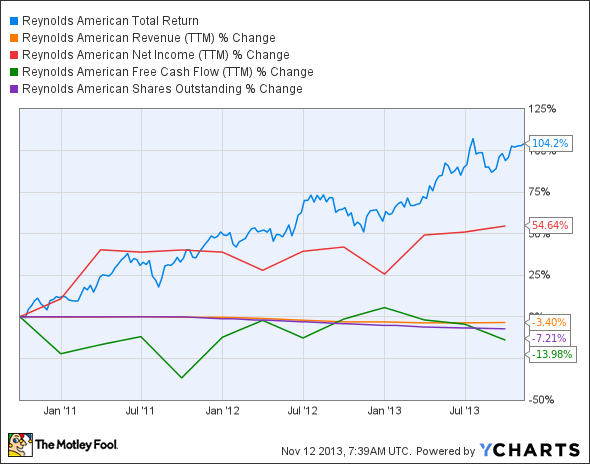 Does Reynolds American, (NYSE:RAI) fit the bill? Let's look at what its recent results tell us about its potential for future gains. We looked at Reynolds American last year, and it has lost the passing grade it picked up then on a debt-to-equity analysis. The cigarette maker thus finishes with only four out of nine possible passing grades. The company raised $2.55 billion in debt in late October to pay off existing debts and repurchase shares. An ongoing public health campaign has also have impeded the overall growth of the tobacco industry. Can Reynolds American overcome the obstacles in its path and continue to produce solid returns for shareholders, or will recent gains go up in a puff of smoke? Fool contributor Sean Williams notes that the Food and Drug Administration recently ordered tobacco producers to disclose quantity levels of about 20 hazardous chemicals used in cigarettes to the general public. In addition, the Centers for Disease Control and Prevention has led a long-running advertising campaign to highlight the dangerous effects of smoking, which has pushed down the number of smokers in Reynolds American's only market. Fool contributor Ben Popkin notes that the traditional cigarette market has been shrinking between 3.5% and 4% year by year, because of regulatory threats and anti-smoking campaigns. Consequently, Reynolds American has reported a decline of 4.3% in the number of cigarettes shipped during the third quarter, but rivals Lorillard (UNKNOWN:LO.DL) and Altria (NYSE:MO) reported a gain of 3.5% and 1.3%, respectively. Since the tobacco market's size won't grow for these three companies, this indicates that Reynolds American is losing market share to its peers. Lorillard's discount Maverick and Old Gold brands continued to take market share from both Reynolds and Altria. In an effort to keep their profits up, Reynolds and Altria have recently shed their U.S. workforce by 15% and 10%, respectively. To counter these threats, U.S. tobacco companies have been aggressively betting on the small but rapidly growing domestic e-cigarette market, which is expected to be worth a total of $1.7 billion this year. Reynolds American recently launched its first ever e cigarette, VUSE, which purportedly uses smart technology that makes it more satisfying and efficient than other e-cigarettes. However, Lorillard's e-cigarette, Blu eCig, is by far the best-selling e-cigarette, as it currently controls roughly half of the domestic e-cig market. However, Fool contributor Rupert Hargreaves notes that the FDA has plans to treat e-cigs the same way it handles traditional cigarettes, which could impede further growth. Today, Reynolds American has some of the qualities that make up a great stock, but no stock is truly perfect. Digging deeper can help you uncover the answers you need to make a great buy -- or to stay away from a stock that's going nowhere.